Graphene (GR) is the most promising material in the field of nanotechnology and has become a sparkling rising star on the horizon of material science. GR, a single layer of graphite, possess a unique two dimensional structure with sp2 hybridized carbon atoms. Due to its unique planar structure, large specific surface area, superior electron mobility, conductivity, excellent transparency and high chemical stability, GR is regarded as an extremely attractive component for the preparation of GR-based nanocomposites for energy storage and conversion. 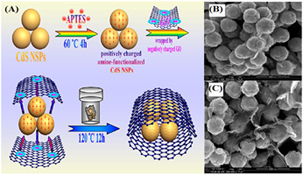 GR-based semiconductor nanocomposites attracted extensive attention in photocatalysis. This critical review summarizes the synthesis, properties and characterization of GR. In addition to this we will also describe the insitu and exsitu synthetic strategies of GR-based semiconductor photocatalyst, fundamental principles of photocatalysis and also the photocatalytic applications of GR-based semiconductor photocatalyst.